Rurouni Kenshin: Trust & Betrayal is a 1999 OVA series of four chapters in length. 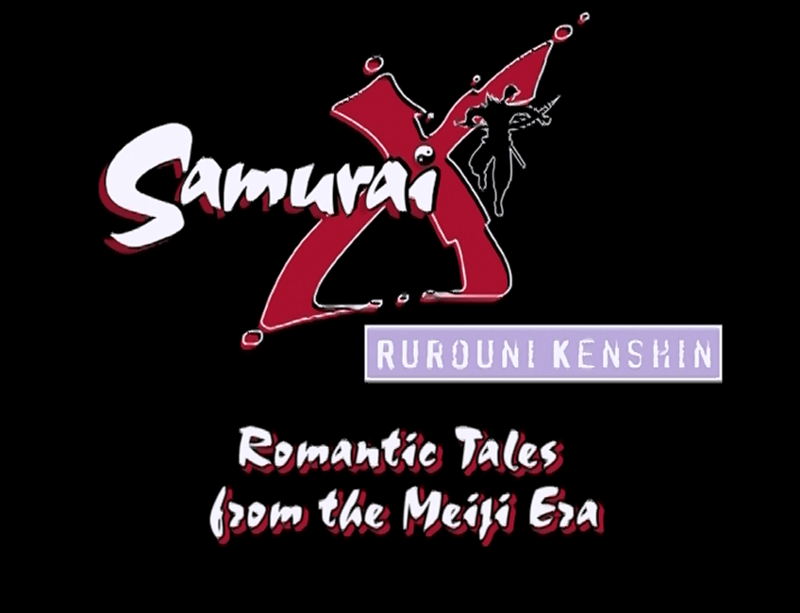 Based a portion of the Rurouni Kenshin manga by Nobuhiro Watsuki, the production’s original North American release through ADV came under the more ridiculous and unrepresentative title, Samurai X, supposedly at the behest of the Japanese licensor. 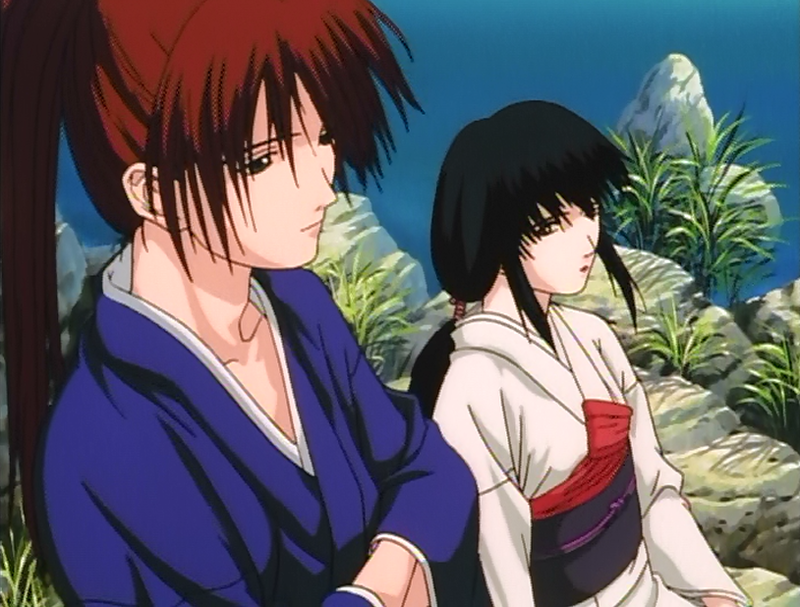 The production of the OVA followed the conclusion of the ninety-five episode Rurouni Kenshin television series, which aired its final episode in 1998. Rurouni Kenshin as a whole follows the adventures of Kenshin Himura, a highly skilled swordsman trained in the deadly Hiten-Mitsurugi style, during Meiji-era Japan of the mid-late 1800s. 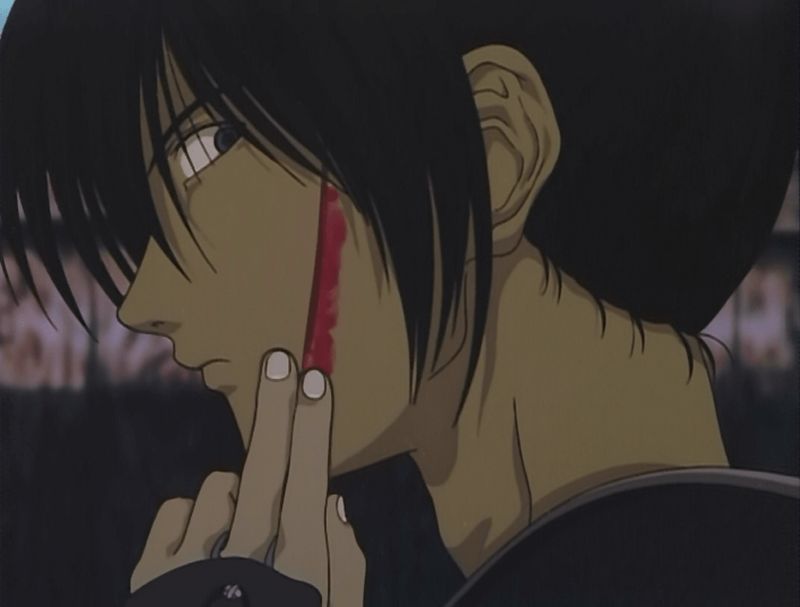 Kenshin has a reputation as a deadly assassin, and is easily recognized by his red-hair and the cross-shaped scar on his left cheek. However, having left his assassin’s life behind, he chooses to wield a blade with the traditional cutting and blunt edges reversed in order to avoid killing unless he absolutely must. Though this is a tale of a bloodier, more willingly violent era in Kenshin’s life. In a way, the production of Trust & Betrayal feels like an effort on the part of the creators to atone for mistakes made regarding the TV show. Like many anime TV series based on popular, on-going manga, production of the series would at times get ahead of the manga storyline, leading to what are commonly called “filler episodes;” episodes that avoid critical plot elements, and that could otherwise be ignored once more of the proper manga storyline is adapted. There’s nothing inherently wrong with filler; many shows have resorted to it, and some have handled it better than others, but in the case of Rurouni Kenshin, the show’s entire third and final season is filler. Filler so far below the usual standards of the manga storyline that viewers dropped out and the show was cancelled before the proper conclusion could be animated. With that in mind, Trust & Betrayal focuses specifically on Kenshin’s origins and backstory; elements important to the manga’s final “revenge” arc that the TV series left untold. Set against the backdrop of the waning Tokugawa shogunate in 1864, it depicts Kenshin at his most violent, as an assassin hired for the purpose of aiding a rebel faction in bringing the shogunate government down. Yet Kenshin was not born a violent man; in flashbacks, we learn about his early childhood as an orphaned boy named Shinta, traveling with a group of slave-traders when they’re attacked by bandits. Rescued by Hiko, a master swordsman, Shinta is taken in as Hiko’s pupil after impressing the man with a display of innocent humanity. Specifically, by digging graves for slave, slave-trader, and bandit alike. As a grown-but-still-young man, Shinta, dubbed Kenshin by his teacher, sets off into the turbulent world with an idealistic desire to help the suffering. The chaos of Japan’s political landscape of the time ultimately leads him into the arms of a rebel organization in need of an assassin. 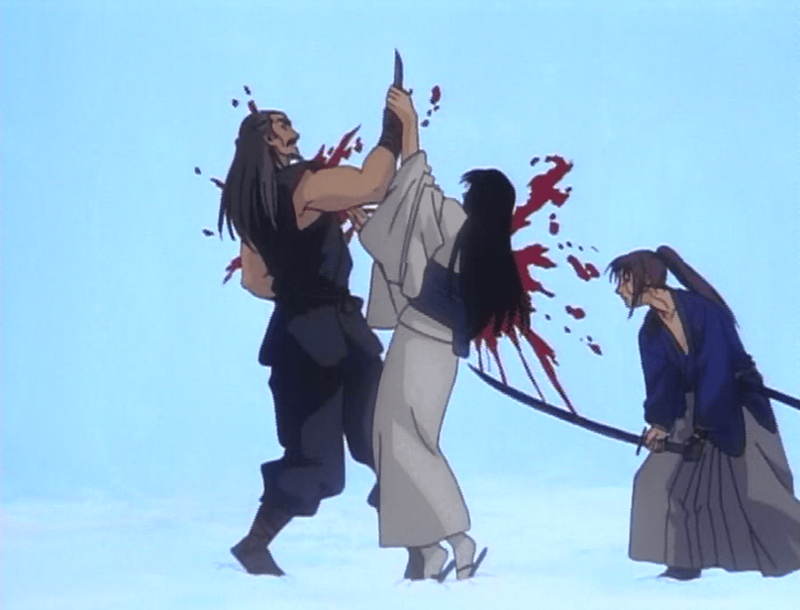 But, though he is normally unmatched, the bodyguard of one particular target manages to slash Kenshin’s face in a desperate, but failed bid to stay alive. Kenshin spends a year engaging in such work, and the toll wears on his humanity. It threatens to take away his kind heart, right up until he has a chance meeting with a beautiful young woman named Tomoe Yukishiro, who drunkenly bears witness as Kenshin kills an assassin out for his own blood. 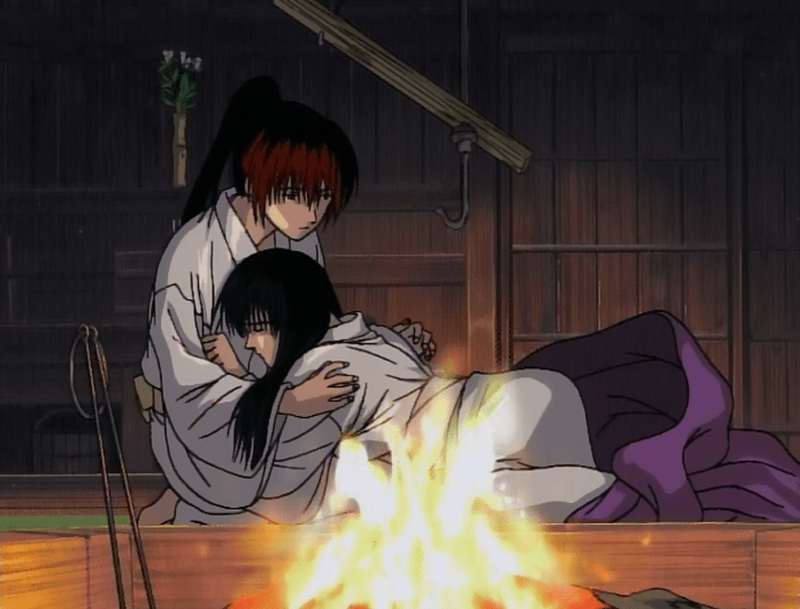 Kenshin aids her by bringing her to the inn at which he normally stays, finding her both shelter and employment. Tomoe is unfazed by the splash of blood she wanders into. Tomoe herself is the second key figure of Trust & Betrayal; just as important to the story as Kenshin himself, if not more. 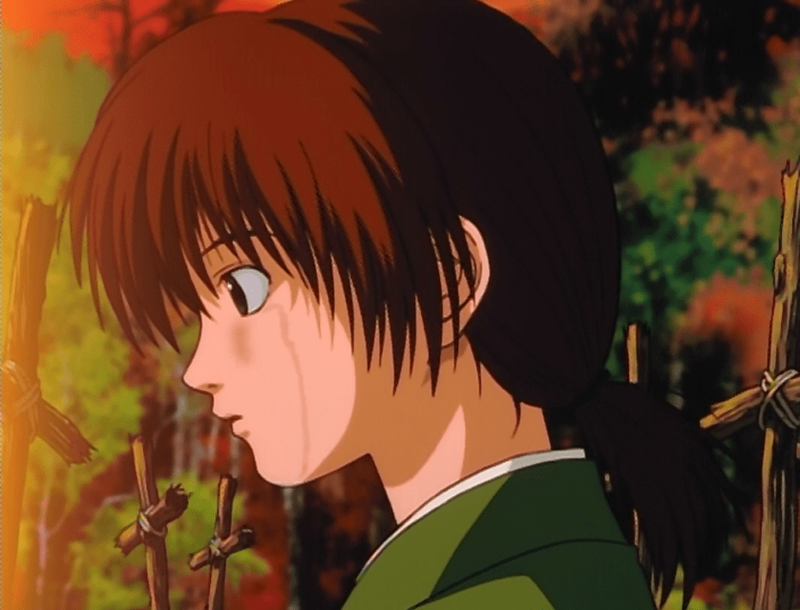 She is a reserved woman, well outside her element in the violent streets of Kyoto, yet she is encouraged by others to serve as the sheath to Kenshin’s sword, and be the emotional center that allows him to retain his humanity. When the rebellion goes sour, and Kenshin and Tomoe are forced to hide, they’re set up in a countryside cottage and are required to play out the role of husband and wife. The two take to their forced domestic lives surprisingly well. For Kenshin, this shift in his life turns out to be a blessing. Living in peace and quiet with Tomoe allows him to regain that emotional center he had lost. Yet for Tomoe, it’s not so simple; in fact, she has every reason to hate Kenshin. 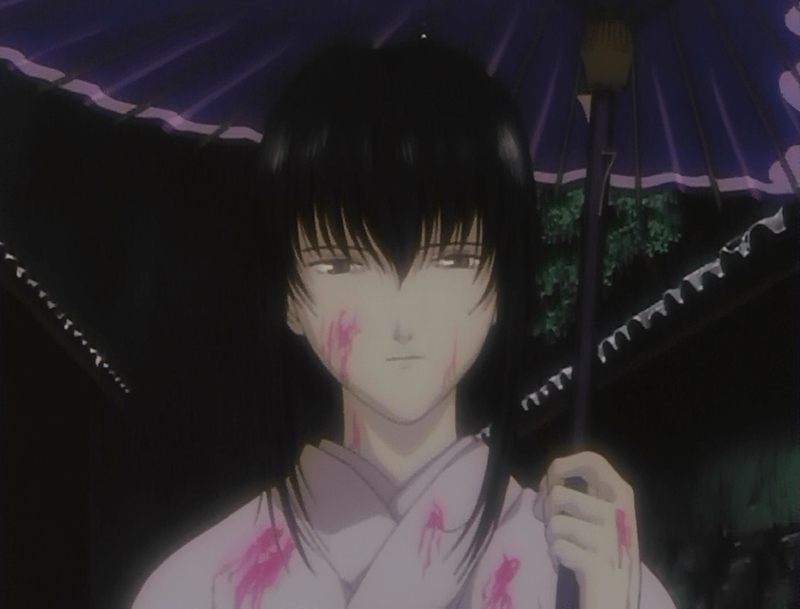 The man that had managed to scar Kenshin’s face was none other than Tomoe’s childhood friend and fiancé. She had come to Kyoto blindly seeking revenge, only to find that the man responsible wasn’t a horrible monster. She’s caught in an emotional trap; one part desiring revenge, and yet another falling in love with Kenshin. Despite the desires that drove her to meet him, she doesn’t want to kill him and doesn’t want to see him killed. As she comes to know Kenshin, Tomoe’s quiet rage gives way to something else. But her desires are at odds with members of the shogunate she had secretly conspired with, and once the wheels are finally set in motion, she finds that her role in the plot was of little importance, and there’s nothing she can do to stop them. They merely used her as a pawn to soften Kenshin’s heart and make him easy to take down. Forced to sift through her conflicted emotions for her dead fiancé and for Kenshin, the final actions she takes as the story reaches its conclusion shape the person Kenshin becomes going forward. As she moves to save his life, she allows Kenshin to cut through her and kill their enemy. And as her final act, born out of equal parts love and hatred, she cuts Kenshin’s face across the scar her fiancé had left. Tomoe saves Kenshin’s life at the cost of her own. The entire tale is one played out as a drama, with no real humor to be found. It’s a tone that stands in contrast to the manga and television series, both of which feature light-hearted, and at times, outright silly moments interspersed with the drama and action. In these other media, Kenshin himself is often the subject of humorous pratfalls. But the lack of such humor works in the favor of Trust & Betrayal, particularly with the OVA’s more realistic, less stylized character designs and artwork. The audio also follows along this same line, as the J-Pop theme songs of the television series are nowhere to be found here. Instead, the soundtrack is entirely orchestral, perfectly accompanying every scene, whether they’re the more brutal moments of action, or the quiet, melancholic moments in the countryside cottage. What does remain the same are the voice actors for those characters that previously appeared in the television show, who make the transition to this more dramatic interpretation of the material with ease. In all, Rurouni Kenshin: Trust & Betrayal is a unique adaptation of a key portion of the original manga storyline that was unfortunately left untold by the television incarnation. It ends with hints of the story to come, equally beautiful and blood-soaked. And yet it also works well as a stand-alone tale of tragedy and redemption. One does not need to be a fan of Rurouni Kenshin to enjoy this OVA; one only needs to be in the mood for a good romantic drama. Rurouni Kenshin: Trust & Betrayal was most recently released on Blu-ray in North America by Aniplex USA. The release features both the original Japanese audio with English subtitles as well as an English dub. It is not rated, but contains graphic violence.